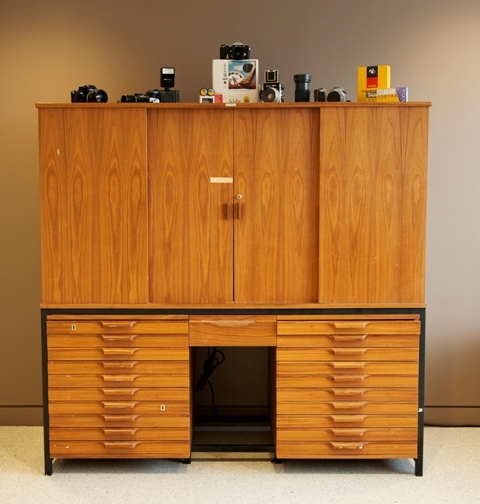 Last fall a piece of furniture showed up in the Smithsonian Institution Archives (SIA) reception area. Aside from a few nicks, it is a large, handsome cabinet with drawers and double sliding doors. When the doors open, a backlight flickers on and 35mm color transparencies arranged on sliding holders can be moved in front of the light. Each holder contains an amazing assortment of images—from Smithsonian buildings to First Ladies’ dresses to natural history artifacts. Every 35mm slide is numbered; and the drawers below the display area house copies of the slides, organized by their ID number. 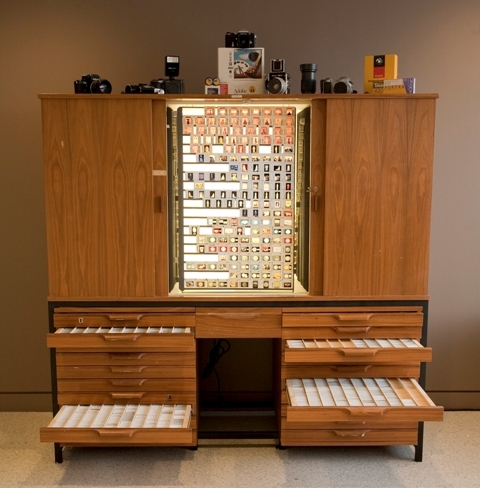 This cabinet—of curiosities, really—has become a metaphor for me of the Smithsonian Institution Archives’ recent adoption of the historic photographic morgue of the Smithsonian Photography Services (SPS). First of all, the cabinet lived across the mall in the SPS offices in the basement of the National Museum of American History for many years. It was moved to the Smithsonian Archives when the remaining personnel from SPS’s central offices were relocated to SIA’s offices in 2009. The cabinet’s contents are in a format (in this case 35mm color transparencies, both Ektachrome and Kodachrome) that began to disappear—along with most other film and paper based photography—in the astonishingly abrupt switch to digital photography that began a decade ago. The numbers written on the slide mounts, which are meant to be a short-hand for the subject matter, don’t do justice to the profound quantity and quality of information that the photographs convey. 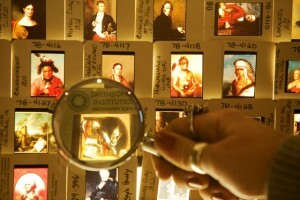 Interestingly, this description of the varied contents of the cabinet also echoes the contents of the enormous cold vaults filled with color transparencies and black and white negatives that are still housed over at the National Museum of American History and that contain, we think, over three million images. Since the SIA took over responsibility for these historic materials in 2009, we’ve made some observations about their content, storage, and care. This huge and diverse collection is representative of the collections of the Institution, whether they are airplanes, decorative objects, frog specimens, living orchids, American textiles or African textiles, and it speaks of the energy of this Institution that thrives on the documentation and study of material and physical culture. While SIA is the natural custodian of this historic image archives, we are not the experts in the content. And although this collection was created and managed by photographers for over 40 years, we’re going to have to rely upon the curators of the Institution to give the images meaning. Much like the cabinet, which has seen better days, the SIA has inherited a cold storage system that is beginning to fail. Cold temperatures are essential to the long-term preservation of film materials; if the founder of the original Photographic Services hadn’t had the foresight to build cold storage vaults 30 years ago, the images would have faded and the plastic films deteriorated. Plans are underway for a new cold vault. "The [SPS] collections . . . comprise one of the most important historical resources of the Institution . . . Bringing these two units [SPS and SIA] together provides the opportunity to pool a vast amount of institutional memory, technical expertise, and complimentary professional skills to vastly enhance access to and preservation of the Institution’s visual history." Readers of this blog will have already met our new photograph archivist, Marguerite Roby. Our resourceful fulfillment manager and part-time photographer, Michael Barnes, was profiled a few months ago. And John Dillaber, digitization specialist extraordinaire, has also had a spot on this blog. They are part of the team that is going to make it possible to access these pictures and preserve them for the future. We’ll keep you posted on progress.